This is our slowly changing kitchen. 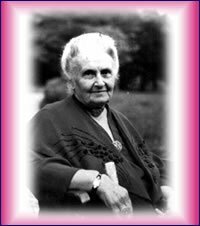 Many things were in place before I got interested in Montessori because they were, to be quite honest, just common sense. However, the one thing I have not ever used in our kitchen, and I think this is a perfectly reasonable adjustment, is a small child sized table. 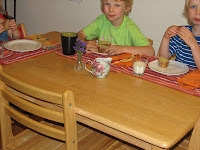 For us, it is important that we can all eat together, so all the children have the Tripp Trapp chairs including the toddler, with no restraints. They are then able to be at the height of our family kitchen. The toddler soon learned to get up and down on her own. This is not exactly the best example of a meal as the children were not using silverware. But I have a basket with handles that contains napkins and placemats. We try to use these all the time, but this is a habit we are getting into. We have switched from plastic to glass and proper crockery and silverware. We have probably only had one breakage in the last two years! We also have a small vase with some flowers in it. These ones are actually dried from our last bouquet from Trader Joes!! 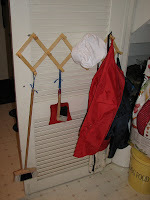 Here you can see that we have adapted our cupboard by taking off the door. 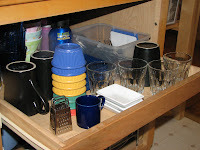 In here we have plates, cups, glasses, dipping dishes, small ramekins for tomatoes and other side dishes and cutlery. There is also a small grater there for the children to grate their own parmesan onto pasta. 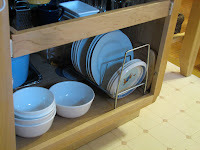 The lower shelf contains the plates and bowl. Now this I am still in two minds over. Partly because I am running out of lower units, and partly because it is actually a devil in disguise. 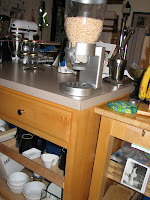 It is a cereal dispenser. The idea i got from our school auction this year where some parents had lovingly created the "perfect" Montessori child kitchen. There was a dispenser and it seemed such a good idea at the time. The children are free to get their own cereal for breakfast without the difficulty of manipulating boxes which are big and cumbersome. However, my children have issues with the cereal choices in the morning and they soon go off the cereal that is currently within the dispenser. Not sure how Montessori would have tackled that one! This is a great sideways picture (sorry folks!) of how I have adapted my butcher's block to provide storage for pencils and paper and on the lower shelf table cleaning materials. I have chopped up some sponges into quarters and put in a spray bottle with water and Doc. Bronner's and a couple of cloths to dry. The photo hanging is actually in a bag of pictures for the toddler to help her make a sandwich. I have put all the equipment she needs on laminated pictures into a bag. She can then use this to get the stuff she needs to make her own lunch! Cleaning equipment lives on these pegs in the laundry cupboard. Not an awful lot of this gets used as the kids (and I!) favour the speed of the dog and the dustbuster! Still, the thought is there! And we are just starting with the baking. This tends to be an activity I prefer to do with one child at a time, so doesn't happen that often. But we have mini baking tins, a pastry brush, measuring spoons (and a cup) and this was my daughter's graduation present from the toddler class (the whisk). I am in the process of providing pictures for making muffins just like the making a sandwich, that way, certainly the younger two can get out the equipment. My eldest can follow a simple recipe with guidance so he will have a few easy recipes to choose from. The harder part in all this, is that the ingredients they need are up high in the pantry, out of reach and in sealed tins and containers. I have to work with the space I have and the mice too! We also have a climbing step so that all of them can easily reach the work surfaces and kitchen sink. I dont' suppose there are many homes with the luxury of child sized work surfaces, so this was just a cheap Target wooden step stool - job done!! Hi! Thanks for some great pics of your kitchen set-up. How young (and in what ways) did you begin setting up the kitchen --I have a 5 month old who holds the spatula while I carry him around the kitchen but want to think ahead!